The 200-05305 Wind Monitor-AQ is a high resolution wind sensor designed specifically for air quality applications. It combines simple, corrosion-resistant construction with low threshold, fast response and excellent fidelity. The 200-05305 Wind Monitor-AQ is a high resolution wind sensor designed specifically for air quality applications. It combines simple, corrosion-resistant construction with low threshold, fast response and excellent fidelity. The Wind Monitor-AQ meets the requirements of the following regulatory agencies: U.S. Environmental Protection Agency-Ambient Monitoring Guidelines for Prevention of Significant Deterioration (PSD). U.S. Nuclear Regulatory Agency-NRC Regulatory Guide 1.23 Meteorological Programs in Support of Nuclear Power Plants. American Nuclear Society-Standard for Determining Meteorological Information at Power Plants. Wind speed is sensed by a lightweight, carbon fiber thermoplastic (CFT), helicoid propeller. Propeller rotation produces an AC sine wave voltage signal with frequency directly proportional to wind speed. Slip rings and brushes are not used. The instrument body is UV stabilized plastic with stainless steel and anodized aluminum fittings. Precision grade, stainless steel ball bearings are used throughout. Transient protection and cable terminations are located in a convenient junction box. The instrument mounts on standard 1 pipe. 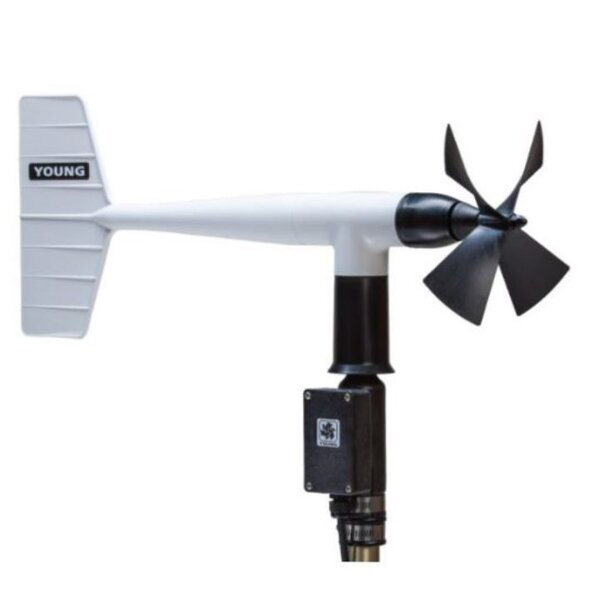 The wind direction sensor is a lightweight vane with performance characteristics that assure excellent fidelity in fluctuating wind conditions. Vane position is sensed by a precision potentiometer. Output is a DC voltage directly proportional to vane angle. The Wind Monitor-AQ is available with two additional output signal options. Model 200-05305V offers calibrated 0-1 Vdc outputs (0-5 Vdc optional), convenient for use with many data loggers. Model 200-05305L provides a calibrated 4-20 mA current signal for each channel, useful in high noise areas or for long cables (up to several kilometers). Signal conditioning electronics are integrated into the sensor junction box. *Nominal values, determined in accordance with ASTM standard procedures. Shielded bearings lubricated with type LO-1 light general purpose instrument oil. 0-50 m/s Add suffix "M"
0-100 mph Add suffix "P"
0-100 knots Add suffix "N"
0-200 km/hr Add suffix "K"